Let's look at his alleged successes, shall we? Let's start with his claim concerning the Dellwood Apartments infrastructure. I do remember him going out there to offer his help for residents who were having trouble with the water/sewage system in the apartment complex. But eventually the tenants moved out because the problem came back. It's good to be available in times like these - when people face daunting housing problems - but these are basic services that people depend on. Taking credit for this is lame. 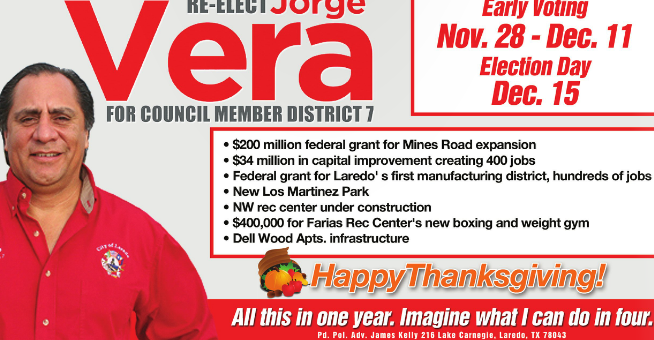 Next up, the $400,000 Farias Rec. Center boxing and weight gym. It was approved after the city secured millions in Community Development Block Grant money for many things, not just the boxing gym. 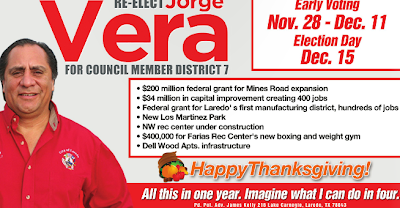 Block grants are nothing new to Laredo. The councilman lucked out that some money went his way, but it's nothing extraordinary on his part. The Northwest Rec. Center. It was actually started while Jose Valdez Jr. was in office. Construction was halted when the city started having problems with the contractor in charge of the project. It's now back on. Trivial details for somebody running a runoff campaign. The "New Los Martinez Park" doesn't actually exist. It's not on the Parks & Leisure list of parks. One thought that crossed my mind is that the department just hasn't updated their list, but when I called P&L to confirm, I was informed that the park is not property of the city if it's not on the list. Nevertheless, Mr. Vera actually has it on his page. And it's in a flood plain. Why does Los Martinez and flood sound so familiar? Oh yeah! As far as the federal grants for a manufacturing district, I need help with that because I have no idea what he's talking about. Capital improvements happen city-wide, not just in his district. And those projects come up on a yearly basis. If you don't have capital improvement projects, then residents like the ones in Los Martinez, and the Dellwood Apts. start to get cranky. And lastly, the Mines Rd. expansion. I didn't know there was an expansion taking place apart from the one that happened two years ago. The election is in 15 days. Let's see if the public buys what Mr. Vera is selling. Lower Prices At The Pump!